Direct Ferries allow you to compare all ferries to Bari in Italy to ensure you get the best possible ferry price for your crossing. 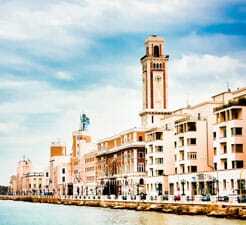 Not only will you get a ferry price for your chosen sailing but we’ll also show you prices for ferries to Bari around your preferred departure time as well as sailings to alternative destinations to ensure you get the best available price for your trip. All you need to is pick the departure port for your ferry to Bari, select the number of people travelling on this journey and search! "Travelling from Durres to Bari"
The ferry was solid and good, the staff was helpful and supporting. Everything was just okay for a good journey. We had nice weather, so we stayed a lot in the outside deck. But when we wanted to move inside, we couldn't find any seats, they were all occupied. Travellers were also resting in the floor, so be advised - take with you a large towel or beach cloth. You can find drinks, food. "good and bad side "
it was good but on arival we waited abut 3 hours to get out! !